Save on simple espresso with the refurbished Saeco Incanto Carafe! You get all the ease-of-use a one-touch superautomatic can offer, without the pricetag of a brand new model. 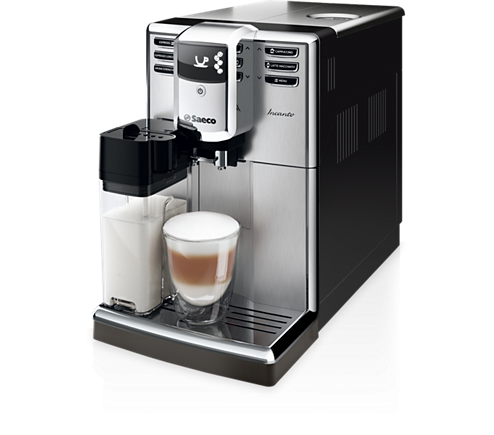 Equipped with a built-in grinder and a refrigerator-safe milk carafe, pulling a shot of espresso or latte is a single button touch away. And with Saeco's simple maintenance features—like a removable brew unit and optional water filtration—cleanup is just as easy. One-Touch - Take the work out of morning coffee with one-button lattes and cappuccinos. Milk Carafe - A removable milk carafe plugs in to the front of the machine, and can be stored in the fridge. Dishwasher-safe Brew Unit - Pop out the brew unit and toss it in the dishwasher for easy cleaning. Optional Water Filter - Add a Saeco Intenza water filter to lower the frequency of descale cycles. Easy-access Water and Beans - Flip-top reservoirs for water and beans make the Incanto easy to refill. Prime Pricepoint - The full milk carafe functionality of the Incanto is nearly unheard of at this price-point. Care-free Cappuccinos - Plug in your carafe and tap a button—instant caffeine gratification at your fingertip. Simplicity - Unlike many other similarly-equipped machines, the Incanto is gratifyingly simple to set up and operate. Top Tank - If you'll be putting this machine under a countertop, be ready to pull it out with every refill. Silly Spout - The spout is adjustable, which is a great idea. but it doesn't really adjust low enough for shot glasses. The new Incanto follows its predecessor in name only, nearly every bit of tech has been improved or changed from the original model. The milk carafe tends to condense steam between uses. If you're going for a latte, you'll get better milk if you let the carafe clear of water before placing your cup under the spout. Brew unit is top-rack dishwasher safe! Clean milk system after every use.